When I first heard about St. Anthony School Programs I was deeply moved. I have been told by many folks at St. Anthony’s how this program has impacted these children with inclusion into the regular classrooms and preparing them for jobs and everyday life. My time is spent serving on the board to help raise money and organize events. I love the positive affect this program has on the community. ~ Chris Herisko, Owner, Pittsburgh Property Guy. Education for children with Down Syndrome and Autism. 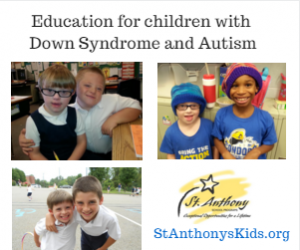 St. Anthony School Programs is a Catholic-based inclusive educational environment for children ages 5-21 with Down Syndrome and other Intellectual Disabilities/Autism. For over 60 years, St. Anthony School Programs has helped both Catholic and non-Catholic students with intellectual disabilities live their lives to the fullest academically, socially, vocationally and spiritually. St. Anthony School Programs provides students with a unique inclusive special needs education program. Individualized lesson plans determine each child’s level of inclusion and special resource room support gives our students every opportunity to learn in a safe and loving environment so that they may grow and become active and contributing members of society. The Inclusive Education Program at St. Anthony’s allows children with special needs to learn and grow in an environment of acceptance and understanding. Each child is embraced for his or her unique gifts and individualized lesson plans are created to maximize strengths and develop confidence and competence in areas of weaknesses. The program is available for children of all faiths ages 5-21, offering a curriculum of academics, spiritual development, social development, and includes specialized services such as instruction in daily living skills, motor skills, behavioral support, and speech and language therapy. History of St. Anthony School Programs. Over the years we have seen St. Anthony School Programs grow and expand to help more children in need. Why Support St. Anthony School Programs? St. Anthony School Programs and its predecessors have been helping young people grow strong in spirit for nearly 100 years. We are particularly relevant to today’s society because we fill a void in the community. They welcome and support children with intellectual disabilities and their families. These services, whether it is on their own or in collaboration with others, involves building strong kids through developing character, inspiring hope and building self-esteem. St. Anthony School Programs accomplish this through positive role models and peer relationships that will help our young people with intellectual disabilities make the right choices. They help with building stronger families by providing programs and experiences that nurture the bonds of love and trust and encourage family members to treat each other with caring, honesty, respect and responsibility. Currently, St. Anthony School Programs operates four elementary school sites, two secondary sites and one post-secondary site with two training sites, a four-week summer program and an administrative office that coordinates the school’s activities. Today, St. Anthony School Programs serves 120 students at 7 sites. St. Anthony School Programs is needed more today than ever before and vows to provide a quality inclusive education for all of our students, from Kindergarten through college. Cost of Care: Over $17,500 per student per year. Parents pay approximately $6,000 of the cost and St. Anthony School Programs pays the remaining balance. Financial aid is available to those who qualify. Ways to Help St. Anthony’s Kids. Thank you for taking the time to read about this amazing organization that is helping special needs children in our Pittsburgh area. Any donation or support you can offer would be greatly appreciated. This is why I donate my time and resources to such an amazing organization.